Mushroom Models Publications 100th Book. by Robert M. Stitt, Illustrated by Juanita Franzi. Soft cover in A4 format with 248 pages, 268 black and white period photos plus 7 in colour, 15 aircraft profiles plus various lists, maps and plans. Very readable text, excellent profiles by Juanita Franzi, interesting photos and plans which illustrate the text. Considering this is Mushroom’s 100th title, there's no need to state how prolific they are, only to say in my opinion they just get better and better. When the RAF first tested the B-17 Fortress Mk I, they rejected it for night time bombing and as they were unwilling to revert to daylight raids they handed them over to Coastal Command who were desperate for long range aircraft to close the mid Atlantic air cover gap. The B-17 was ideal, being easy to fly, reliable and comfortable considering they would be in the air for ten or more hours. After a short introduction and two forewards we get into the book proper, with titles like Past Lessons, Long-Range Operations, Middle East Side Show, Search Tools, Conflicting Demands and Early Operations. 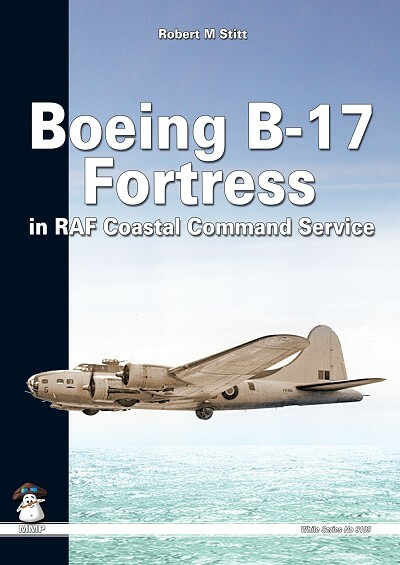 These chapters all concern the early B-17C/Fortress Mk I and its suitability to Bomber Command, trials in North Africa, development of air-bourn radar and handing over to Coastal Command. What follows is the Cheyenne Modification Center, Fortress II, Transatlantic Delivery, Pioneer Crews, Testing and Into Service. This covers the first major modification to the B-17, the “E” and “F” models/ Fortress IIA and II, work done on the aircraft schedualed for RAF delivery, the crews who flew them across the Atlantic and getting them into service with Coastal Command. This is just the first twelve chapers of over forty covering the use of the B-17 by Coastal Command, initially from air bases in Northern Scotland (Benbecula) followed by a short stint in Southern England and then a move to the Azores. All the while there are decriptions of establishing the base at Lagens airfield in the Azores, a tipical mission, attacking a U-boat, successes, failures and accidents. By the end of 1943, the Battle Of the Atlntic had been won and although some anti-submarine patrols were still flown the main emphisis for long-range Coastal Command squadrons began to change to meteorological data gathering, boring but necessary. An aside from the main story is the fate of a B-17E “Mystery Ship” wreck seen near Wau in Papua New Guinea by the auther nearly forty years after it crashed there where most of the US markings had weathered off to reveal a set of RAF colours and markings. Its US serial was 41-9234, still visable on the tail and it turned out to be one of the aircraft earmarked for the RAF via Lend-Lease but subsequently retained by the USAAF for service in the Pacific. Six pages of scale drawings showing the main modificatione done to most of the aircraft followed by the Appendixes, A to M listing everything from individual aircraft histories, U-boats sunk or damaged to Met Profiles Performed and nose art. Last but certainly not least are the 15 profiles by Juanita Franzi. Superbly presented in full colour, there are 3 Mk Is in various schemes, 10 Mk IIAs including one that had a large gun fitted in the nose and three of the New Guinea “Mystery Ship” and finally two Mk IIs including plan and underside views. In the captions for these profiles are included the page numbers where photos of each may be viewed. This is another great book published by Dr. Wallgrove, its just a pity the Academy kit doesn't live up to the book but then Revell is about to release a 1/72nd scale B-17 which I'm told will be a “G” but could there be an”E” or “F” in the future? Hmmm!